This page contains all the names of crew members that have been found so far. If you can add to the information please contact me. A/Lt.Cdr. John Andrew Pearson, DSC, RNR 13 February 1945 ? Lt.Cdr. Colin Courtenay Lowry, RN 26 September 1945 ? Dodd Raymond Anthony Lt 5.41 - 6.43 My wife's stepfather served on HMS Seagull from May 1941 until June 1943. He was Lt Raymond Anthony Dodd. 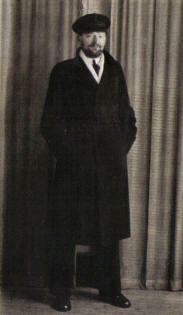 He volunteered in Shanghai Nov 1939, was shipped to Hong Kong and on to England. Had various postings before the Seagull, discharged in November 1946 when he returned to Hong Kong. Returned to England 1959 .Died 1971. Foster Harry Stoker DK/X539612 5.44 - 8.45 My Dad Harry Foster served as a stoker in HMS Seagull from May 1944 (he remembers the grounding incident) until August 1945. He has communicated with Eric Ilott and Albert Walker but lost touch. After Seagull he joined HMS Patroller in Scotland and took her to the far east to pick up many of the (14th?) Army boys. His official number was DK/X 539612 and he is alive and well and living in Cannington, Somerset. His favourite story is going ashore in Ipswich on VE night but wondering how he could conserve the 10 shillings he had in his pocket, he needn’t have worried – he met a bunch of US airman in a pub and they wouldn’t let him buy a drink! I am his son George Foster and I too served as a stoker in the RN from 1963 to 1971. I joined, Seagull as a newly qualified SR3, along with AB Sharky Ward, from the Survey Training Unit, Chatham, run by Lt. Cmdr Steve Ritchie: we were the second class to graduate from the unit. Though nominally drafted to Seagull, we were sent from Chatham to Whitehaven, Cumbria, to join MFV 1189 and two Survey Motor Launches (converted MGB's). We spent four months in the Solway Firth carrying out Tidal Stream Observations for the Disposal Pipeline to be built out to sea carrying waste water from the Atomic Energy plant under construction at Sellafield on the Cumbrian coast. On completion, MFV1189 returned to Devonport: Sharky and I joined 'Seagull. She was employed in the Bristol Channel, mainly sweeping for wrecks, of which there were plenty. Recreation and replenishing was at Swansea, Cardiff and on one occasion, Avonmouth. In mid-December, the end of the surveying season, we returned to Devonport for refit and chart draughting until March 1950. During that period I qualified as Leading Seaman and was promoted soon after as Devonport's roster was nearly dry. The 1950 surveying season ( Seagull's last } was spent surveying in and around Torbay (Bolt Tail to Paignton). What a glorious finale! When I joined her we were sweeping from Belgium all along the coast right up to the Dutch Island of Texel and as the Germans were leaving we got closer to the coast and instead of returning to Margate and safe anchorage we anchored off Ostend for a couple of nights in quiet mode & no lights with lookouts posted but to no avail we lost a Dan Layer each night after which needless to say we resumed safe anchorage at Margate. but the next morning the Armada had gone, apparently another Flotilla got the job, lucky for us unlucky for them. Medals: Won a few medals one of which was a gold medal from Russia that he received in the last few years. It would be much appreciated if you add his name to the list as his birthday is coming up and I am sure he would love to see his name on the list, especially as today he still talks of his sad memories of seeing lots of young lads dying, and of being the last in on D-Day. Peebles Jimmy PO Stoker I believe he came from Ireland. 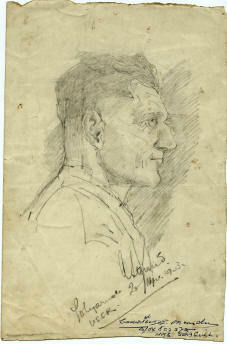 The sketch of Herbert Marsden was drawn by my father Albert Stroud, a signalman on Seagull. He is alive and well and will soon celebrate his 87th birthday. He has kept all of his drawings over the years ( except this one of course ) and has a small sketch pad amongst other things showing some of his shipmates. He still paints and has always had a natural talent for this. Dad was pleased to see to his sketch again and amazed at the power of the internet.